The Samsung F110 calendar offers three views - daily, weekly and monthly. There are five types of events available: appointment, anniversary, holiday, important, and private. The number of alarm slots is also five, each with a variety of configurable options - snooze time, repetition, etc. You can of course choose a custom ringtone to wake you up at a preset volume level. Among the other offerings are the voice memo recorder, a world time application, a calculator, and a unit converter. A countdown timer and a stopwatch are also available. They are the regular well-known applications - nothing fancy, never mind the sporty spirit of the Samsung F110 Adidas. We were let down to find no office documents viewer in the Samsung Adidas phone. It's a feature we've seen in so many Samsung handsets we would've thought it to be default by now. When it comes to games, Samsung F110 is quite well geared. A whole bunch of games are preinstalled just waiting for you to have some free time to spend. The games that the Samsung F110 bundles up are Cannonball, Forgotten Warrior, Freekick, Arch Angel, Midnight Pool (trial), Minigolf Las Vegas (trial), Paris Hilton's Diamond Quest (trial), Tetris Mania (trial) and Asphalt 2 (trial). You've probably seen every one of them on other Samsung handsets. 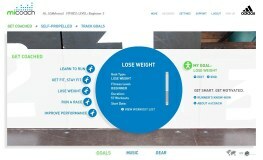 The new Adidas miCoach sports system sounds rather easy. You need to put two sensors on. The heart rate monitor straps on your chest after you've sprayed it with water, and the stride sensor gets fixed on your shoe laces. 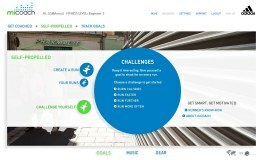 It's recommended that the first time you use the system, you make an assessment run. It's actually the only workout to find preset in the miCoach menu of your Adidas phone when you take it out of the box. The goal in the Assessment run is to run 1.6 km (1 mile, right) as fast as you can. Not that you should get yourself a heart attack on the track if you are an inexperienced user. Take it easy and do as good as you can - you can even walk if you want to. 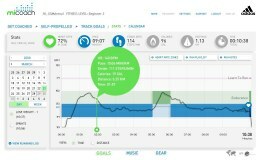 When you are done, grab a bottle of water, set up an account at www.micoach.com, download their synchronizing software and connect the Samsung F110 Adidas via the optional data cable. Now, synchronizing is automatic so you don't have to worry about that. Once all the data from the Assessment run is uploaded, the system evaluates your fitness level and will adjust workouts to your level. Next thing you got to do is pick a running goal. That's what it's all about with the Adidas miCoach system - goals. You can opt for one of the already preset goals - "Learn to run", "Get fit, stay fit", "Lose weight", "Run a race", "Improve performance". 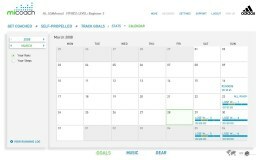 Once you pick a goal for yourself, the miCoach center creates a running program for you and uploads it to your phone's miCoach calendar. If you are not happy with the available goals and you know what you are doing, you can create custom workouts based on preset time, distance, pace, burned calories, intervals, stride rate, or step count. And finally, if that is not enough for you, you can use the challenges system. It simply allows you to put occasional challenges for yourselves to: "Burn calories", "Run faster", "Run longer", or "Run more often". Unfortunately, the last one doesn't involve a mean bloke coming to your place and literally kicking you out to the track, so in the end it's all up to your will. 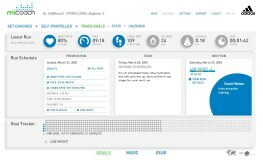 Now beside all that stuff, the miCoach system gives you super detailed stats on your running sessions (getting tired of the word "workout" already?). Plus it presents you the same miCoach calendar that is available on your miCoach phone that also helps you plan your runs. So that's it - at least as far as the online miCoach center is concerned. When you are out on the track, or the road, the street or the beach (lucky you!) 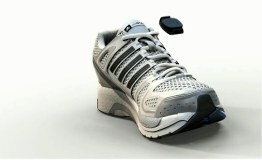 - wherever it is that you like to jog, it all boils down to you and your personal training sidekick - the miCoach phone. So let's give it all our attention.